Wands at the ready! We bring you the second installment of our series exploring some of the theological elements in the Harry Potter saga. You can find part one here. It is no coincidence that ‘Erised’ backwards spells ‘Desire,” the basis of the magical mirror’s enchantment. 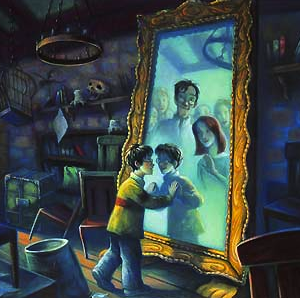 In the first book Harry, in his nighttime wanderings of Hogwarts School, stumbles upon a room completely empty and unused save for this enormous mirror, which startles him due to what he sees in its reflection. Rather than seeing just the room behind him, Harry glimpses his parents and family, those he’d never known and always longed to know. Entranced, he takes Ron the next night to show him his parents. Ron does not see Harry’s parents, though; he sees himself, older, good-looking, and successful. The mirror, in fact, does what all mirrors do, albeit on a deepest level: the Mirror of Erised reflects the heart’s desire. In the same way that an average mirror reflects to the viewer a self which is constrained to its external appearance, this magical mirror makes manifest those invisible deities which lie below the surface. In short, it betrays those idols upon which we’d hang our hat every time. Rowling here is championing an exceedingly low anthropology—no one wants to accept things as they are, and our yearning “if only’s” often arrest our ability to live our lives. Harry and Ron are drawn into their custom-made fantasy worlds: self-induced denials of the truth of their greatest fears, be it dead parents or an unloved, overshadowed sibling. The Mirror does not for anyone reveal a pure desire to live for others, to love compassionately, to seek truth. It simply shows the self-oriented desires of the heart. Moreover, rather than the mirror standing as some Herculean temptation to courageous and pure-hearted soldiers, this mirror conveys, as Dumbledore explains to Harry, what lies precisely within (and not without) ourselves. …At last he knew what Dumbledore would have seen when he looked in the Mirror of Erised, and why Dumbledore had been so understanding of the fascination it exercised over Harry. For Part 3: The Dementor, click here.